An aggressive penultimate race day, with several general recalls, and more than a few Black-Flag Disqualifications (BFD) – over-early, with no opportunity to make up for it. But Race Committee did complete Race 9 and Race 10 under a moderate southwest breeze, with wind reaching into the double-digits (knots), but never really into the teens. Scott Leith (NZL) solidified his lead in the Apprentice division with a pair of bullets today, followed by Jon Emmett (GBR) with a pair of seconds. Carlos Edwardo Weberley (BRA) also did well in the Masters division with a 5th and a 3rd. His closest competition, Richard Blakey (NZL), won the final race, but needed to discard a 14th. In the Grand Master division, Vanessa Dudley (AUS) remained in front with 5-3 finishes and a four point lead. Jeff Loosemore, also representing Australia, had to discard a BFD in the first race today, but posted a win in the second race to remain in second by five points. Luis Castro (BRA) holds third place, winning the first race today, but adding a double-digit finish to his score in the second. Robert Lowdnes (AUS) and William Symes (USA) traded 1-2 finishes today and remain in the lead of the Great Grand Master division, but Michael Kinnear (GBR) dropped back with a pair of double-digit finishes today, neither of which were discarded. Kerry Waraker (AUS) remains at the top of the 75+ division, but needed to discard a BFD in the first race, and is leading only on the tie-breaker with Peter Seiderberg (USA), who posted a 1-2. 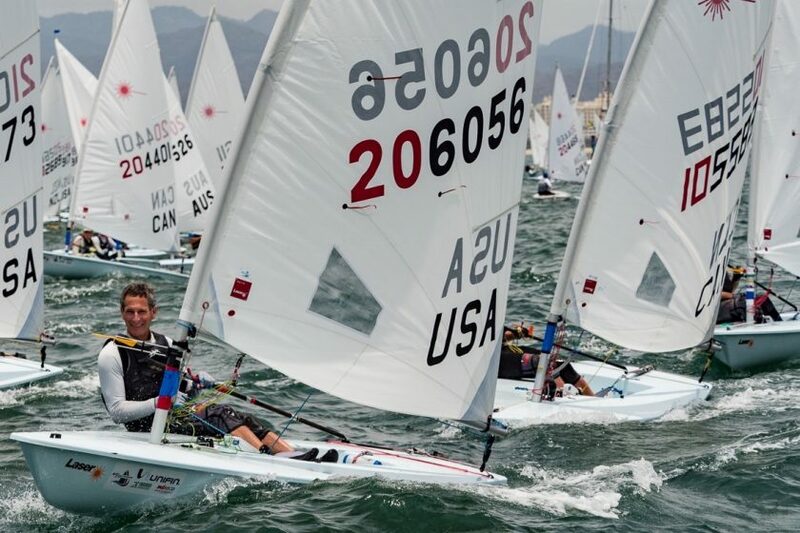 David Hartman (USA) finished 3rd in the second race, but had to discard a BFD in the first. Tomorrow is the final race day of this event, with the champion for each division decided after two more scheduled races. One more day…time will tell!